Jesus regarded the coming of the kingdom of God as a time of judgment. His word of judgment was meant to help people take critically the consequences of their choices either for or against God. Our response to the judgments of God has severe repercussions, both for the present and the future. Jesus states that even family loyalties would be challenged on the basis of whether people accepted the kingdom of God or not. The core of Christianity is loyalty to Jesus, a loyalty that takes precedence over every other relationship. When Jesus spoke about separation he likely had in mind the prophecy of Micah: a man's enemies are the men of his own household. The love of God compels us to choose who will be first in our lives. To place any relationship above God is a form of idolatry. Jesus challenges his disciples to observe who they love first and foremost. A true disciple loves God above all else and is willing to forsake all for Jesus. Jesus insists that his disciples give him the loyalty which is only due to God, a loyalty which is higher than spouse or relatives. It is possible that family and friends can become our enemies, if the thought of them keeps us from doing what we know God wants us to do. 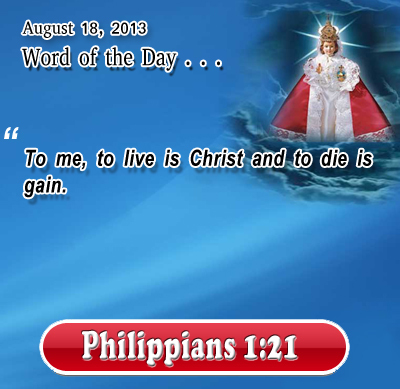 Philippians 1:21 To me, to live is Christ and to die is gain. Heavenly Father, thank you for sending Jesus to show us your love and thank you for sending him again soon to take us home. He is our anchor in the storms of life and our light in the darkest nights reminding us that you love us with a perpetual love. In the name of Infant Jesus, the Resurrection and the Life, we pray. Amen. 49"I came to cast fire upon the earth; and would that it were already kindled! 50 I have a baptism to be baptized with; and how I am constrained until it is accomplished! 51 Do you think that I have come to give peace on earth? No, I tell you, but rather division; 52 for henceforth in one house there will be five divided, three against two and two against three; 53 they will be divided, father against son and son against father, mother against daughter and daughter against her mother, mother-in-law against her daughter-in-law and daughter-in-law against her mother-in-law."